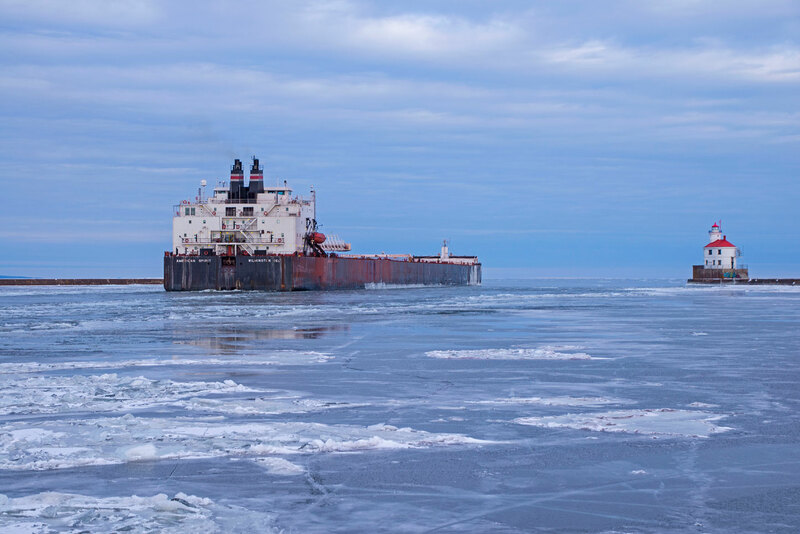 We happened to be driving through Superior, Wisconsin when I noticed that a ship was leaving the docks at Wisconsin Point and that a couple of tug boats were in the area. When we arrived the American Spirit was just entering the ship canal. The Heritage Marine Tug Helen H can be seen in the background. 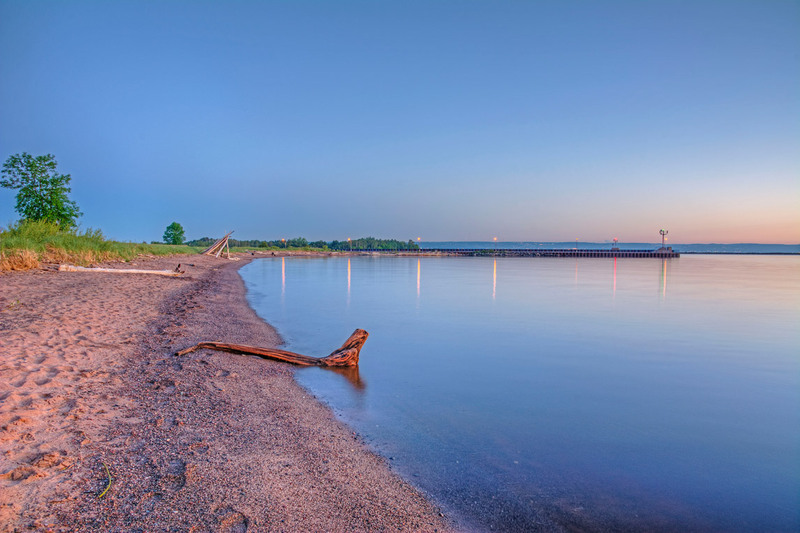 More photos from Wisconsin Point can be found on my website. 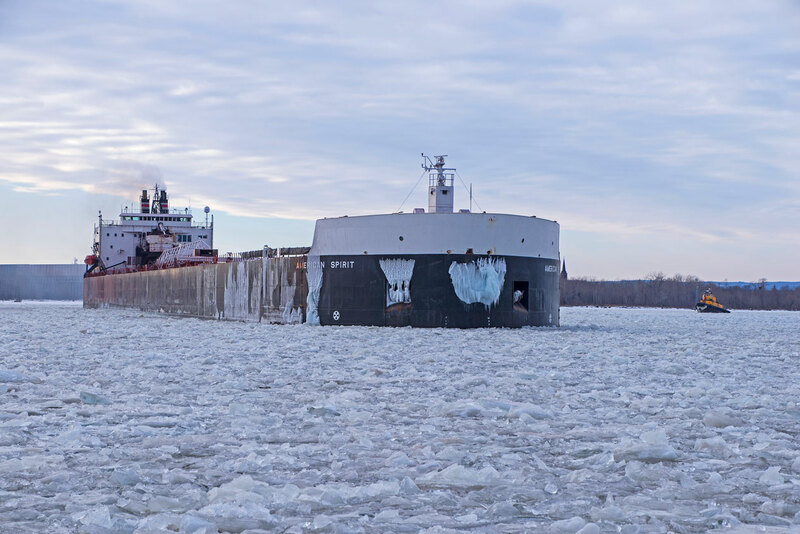 The Great Lakes Towing Tug Arkansas was breaking ice in the shipping canal. The American Spirit sailed out past the Wisconsin Point Lighthouse. 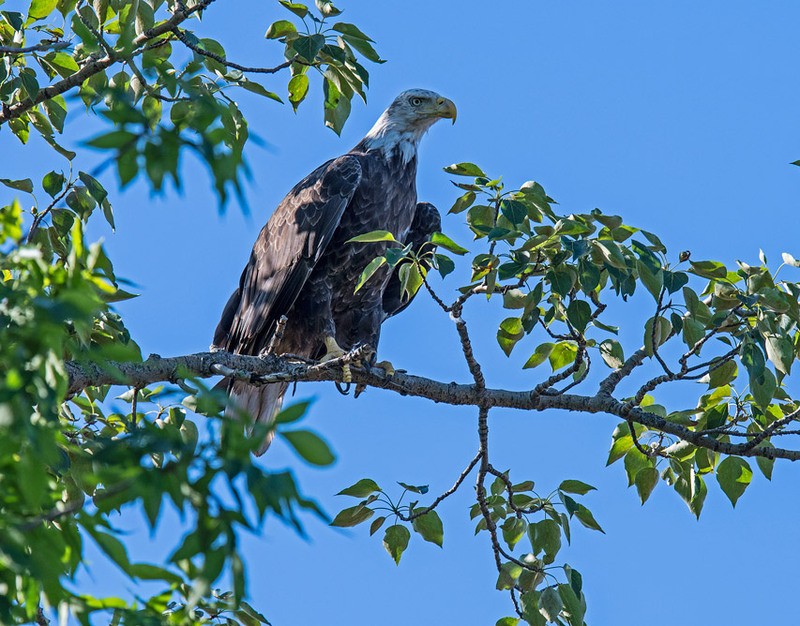 Typically when we drive out to Wisconsin Point in the summer we are able to spot some Bald Eagles. On our last trip we saw over a dozen of them. There were five of them in one tree. 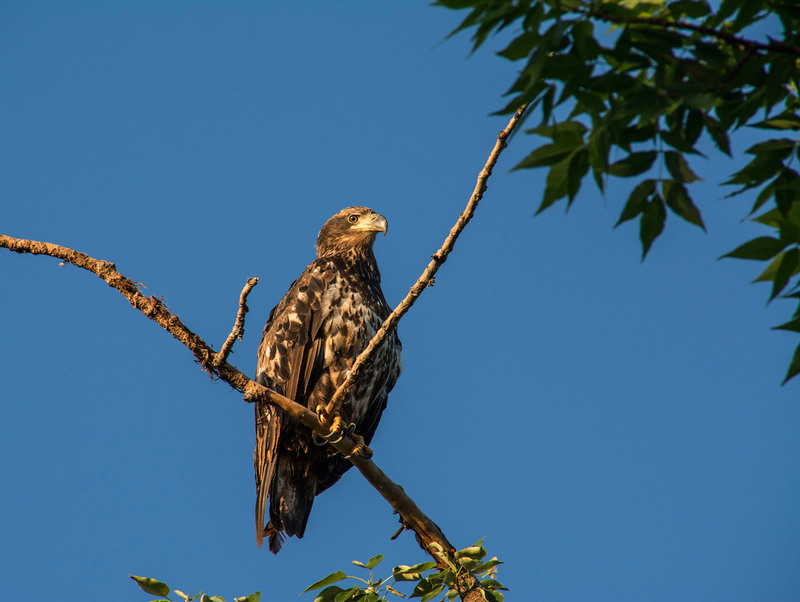 It looked like the two adults along with their three fledglings. 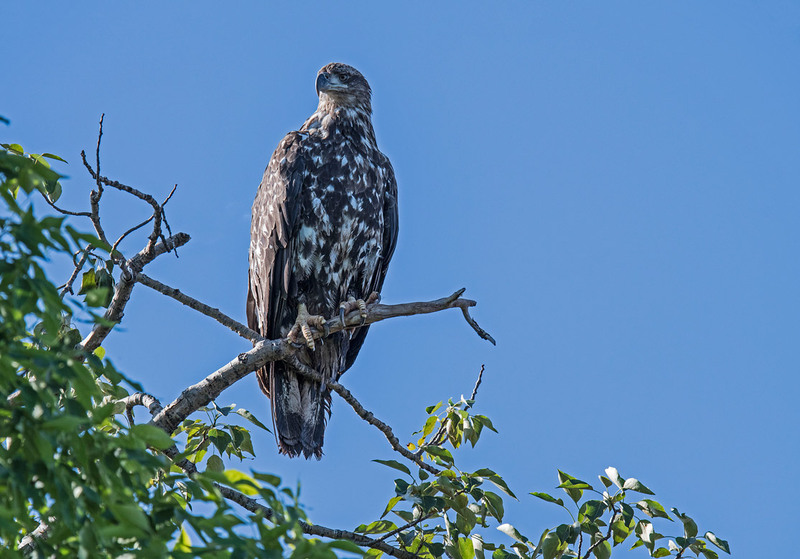 It was by far our best day of eagle watching at Wisconsin Point. 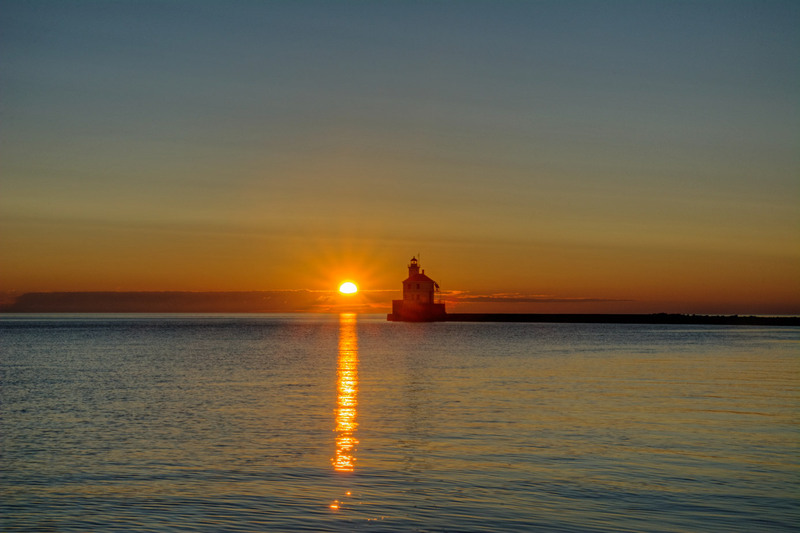 Just about every year we try to drive out to Wisconsin Point to Photograph the lighthouse when the sun rises from behind the lighthouse. We made the trip again this year. 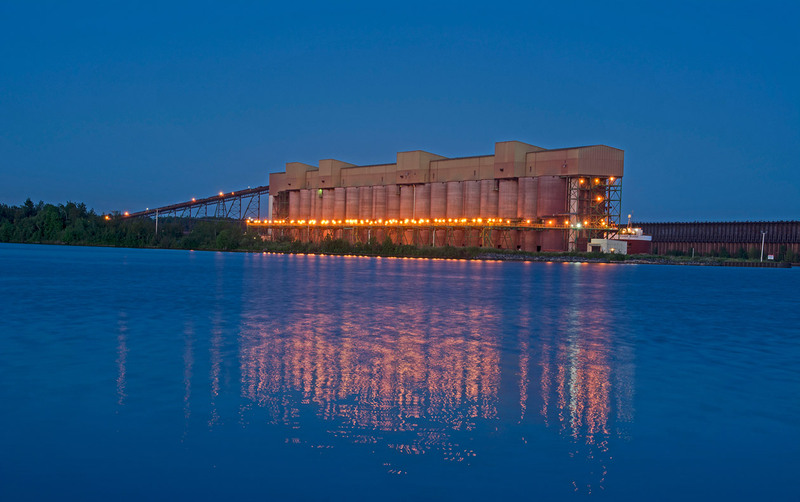 We arrived well before sunrise so we stopped to photograph the Burlington Northern Ore Docks that were lit up. The Roger Blough was at the docks loading Taconite. I was very surprised to find there were no mosquitoes around. We then drove back to the road that leads to the south breakwater where the lighthouse is located. I walked out to the beach for a photo before sunrise. As it turned out the best color was well before sunrise. I decided to walk along the beach between the south and north breakwater photographing from various locations along the way. My wife drove the car over to the north breakwater parking lot to meet me. I then walked out on the north breakwater to watch the sun rise. When I turned around to leave I notice the beach was glowing in the sunrise. 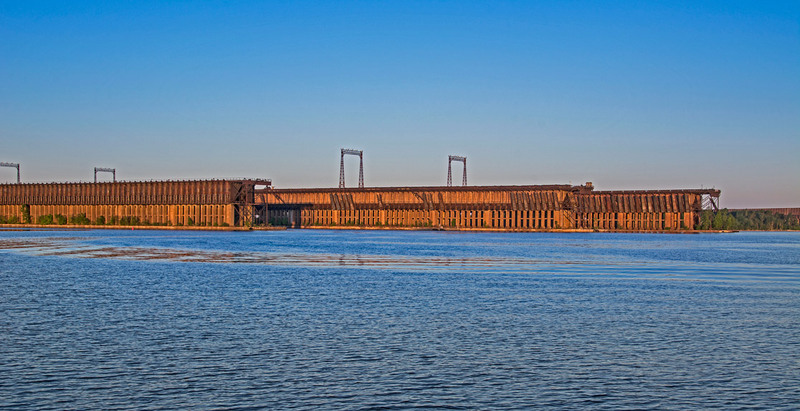 I walked back along the breakwater to photograph the abandon Burlington Northern Ore Docks. As I turned to leave I notice some small rocks on the breakwater. 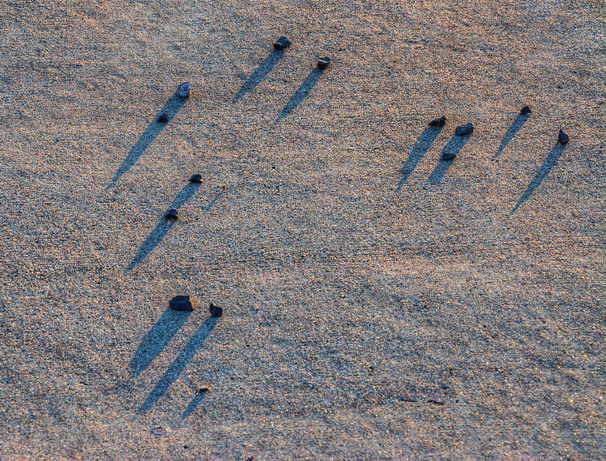 The sun had cast a long shadow. My photo of Wisconsin Point Lighthouse taken during a Mothers Day storm appears as a two page photo spread in the February 2017 issue of Wisconsin Natural Resources magazine. 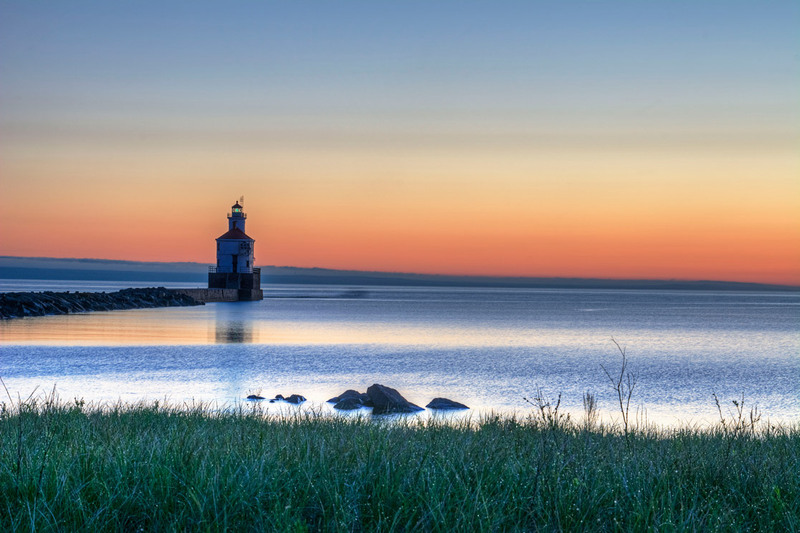 The article is titled “Picturing Wisconsin Lighthouses“. Sad to note that our stupid governor had decreed that the DNR discontinue the magazine because it has mentioned climate change which the GOP had determined does not exist. We got up early, really early, and drove over to Wisconsin Point to watch the sunrise. Sometimes we are lucky and sometimes we are not. This time we were lucky to get a nice sunrise and some interesting clouds. Notice the fisherman walking out to the lighthouse. 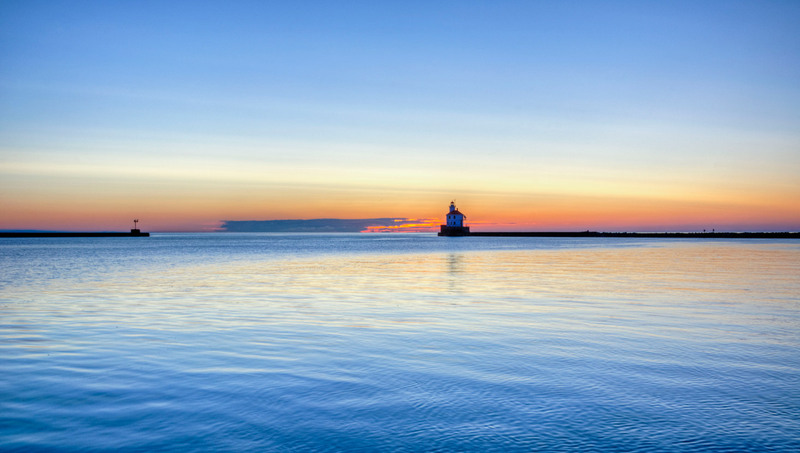 We recently spent a beautiful morning on Wisconsin Point photographing the lighthouse. 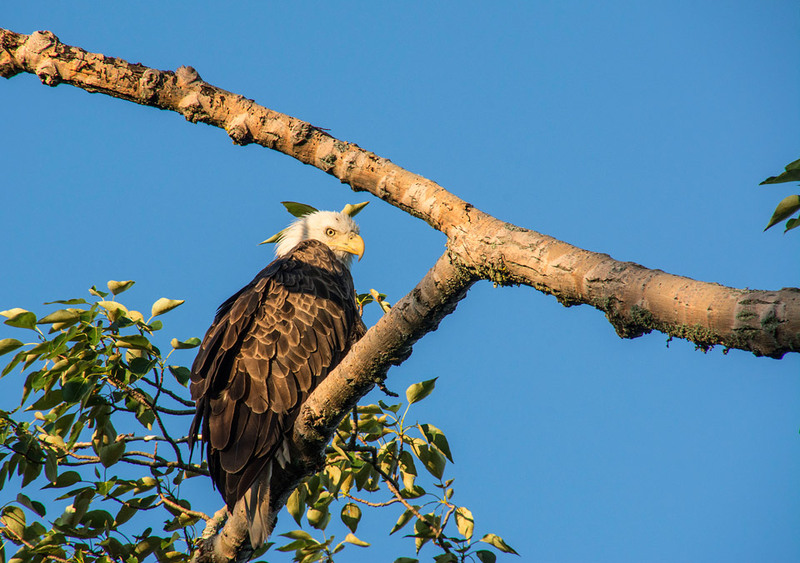 In addition to the lighthouse we saw five Bald Eagles along the road. I was happy to see that I had a couple of photos included in the current Calendar but was appalled to see that one of them was close to a photo of our Idiot governor. The firs photo was taken at Amnicon Falls State Park under ideal water conditions. Unfortunately it was a sunny day which makes waterfall photography difficult. Fortunately I had just purchased a variable neutral density filter which allowed me to photograph the falls at a slower speed even under sunny conditions. The photo of the Coast Guard Cutter Alder was taken during the bitter winter of 2013-14. We were returning from our final visit of the season to the Apostle Islands Ice Caves when we notice on our Marine Tracker that the Alder was out in Lake Superior. 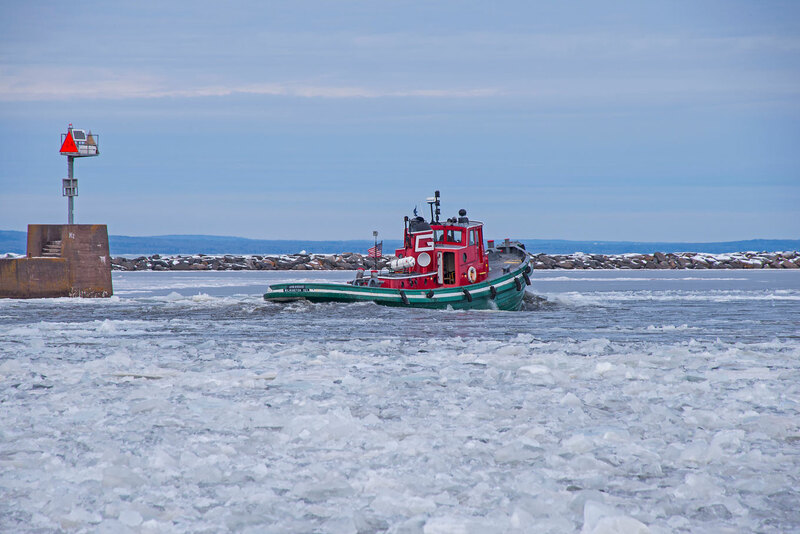 This was the first ice breaking trip of the year for the Alder through the Wisconsin Point Entry. Little did they know that it would be a very long time before ice breaking ended for the season. We tracked the Alder as it sailed out into the lake so we drove out to Wisconsin Point to see if we could photograph it when it returned to the harbor. We waited for quite a while but it didn’t return so we started back to Duluth. 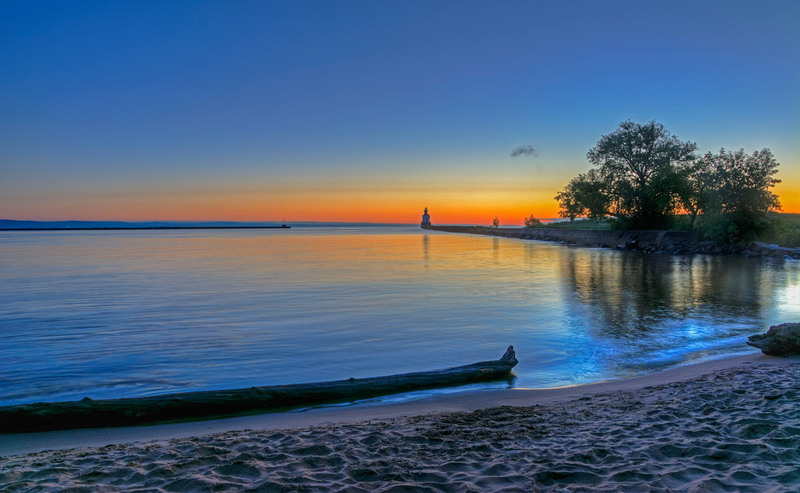 Just as we were leaving Wisconsin Point I made a final check of the Marine Tracker and noticed that it was on its way back into the harbor so we turned around and were lucky to get this photo. We happened to be in Duluth, Minnesota when a Nor’easter came through with gusts up to 50 mph. Unfortunately my wife had gone shopping so I was without a car. I spent the morning watching the waves crash into Park Point Beach. Just as she returned from her shopping trip I noticed the Lake Guardian was going to enter Wisconsin Point so we jumped in the car and drove over to Wisconsin Point to check out the waves and the Lake Guardian. We reached Wisconsin Point just as the Lake Guardian entered the harbor. The Lake Guardian is the largest research vessel on the Great Lakes. It goes out several times a year to carry out research activities. This was the first opportunity I had to photograph the Lake Guardian. he wind was blowing so hard I had trouble walking down the breakwater. The waves were crashing over the breakwater as the ship entered the harbor. There were a large number of Ring-billed Gulls on the breakwater trying to stay out of the wind. We were in Superior, Wisconsin last week and decided to drive out to Wisconsin Point to check on Ice Conditions. There was plenty of ice and a couple of ice fishermen way out in Lake Superior fishing. 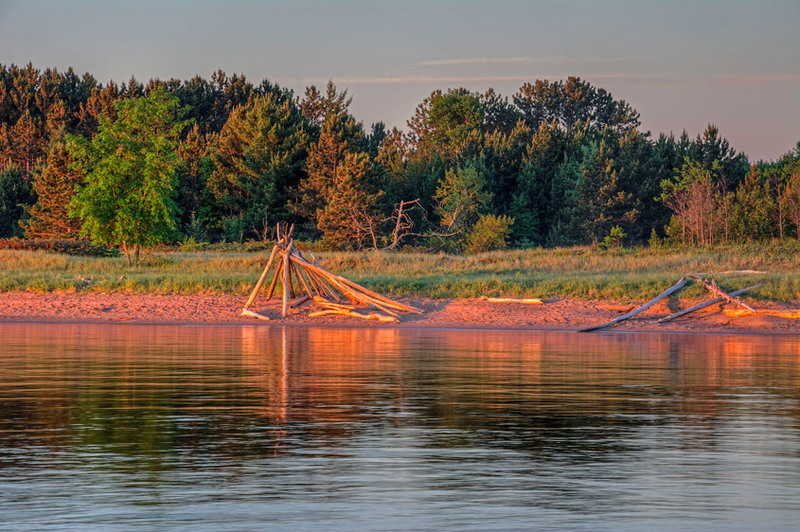 More photos from Wisconsin Point can be found on my website.